As Eric pointed out on Monday Florida statutes have certain requirements that demand that owners are notified if the association gets involved in costly lawsuits that may require that a special assessment is being levied in order to pay for the cost of this litigation. In my opinion another provision that is nothing but something that was put into the statutes to make owners feel better – without any real consequences. Imagine this scenario: “A homeowners’ association sues one of its members for violation of deed-restrictions, parking a big pick-up truck in his drive-way.” After year-long court-battles the appeals court ruled in favor of the homeowner and awards legal fees. Being one of the owners of this association you receive a letter telling you that you have to pay a special assessment in the amount of $8,000.00 within 30 days. Thinking about it, you realize that you were never informed by the association that they were getting involved in a lawsuit that turned out to be that costly. 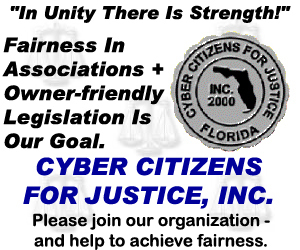 Gee, didn’t the association violate the Florida statute by not informing me about this lawsuit? You are correct, but what are you going to do: File another costly lawsuit trying to convince a judge to agree that a violation occurred that entitles you to be exempt from the special assessment? Remember: If you lose it will cost you a lot more than just the amount you would have needed to pay the special assessment. With other words: How useful are these provisions in the Florida statutes supposedly protecting owners from paying for outrageous litigation cost? In my opinion you don’t need to be Einstein to figure that out yourself!